Beyond providing data for all 32 NFL teams, PFF also supports network broadcasters with game-preview packets that are used to enhance the in-game experience for fans and viewers. This Patriots-Lions preview features the same information our broadcast partners use for team research and in-game production. Patriots running back Rex Burkhead leads the team in carries (24), but he has little to show for it through two weeks. He has averaged just 3.6 yards per carry and forced three missed tackles to earn a 51.1 rushing grade. Though he was expected to rise above the Pats’ underwhelming wide receiver group, Chris Hogan has just eight total targets in two games, ranking fourth on the team. He has hauled in two touchdown passes, but the lack of opportunities is a concern given preseason expectations. 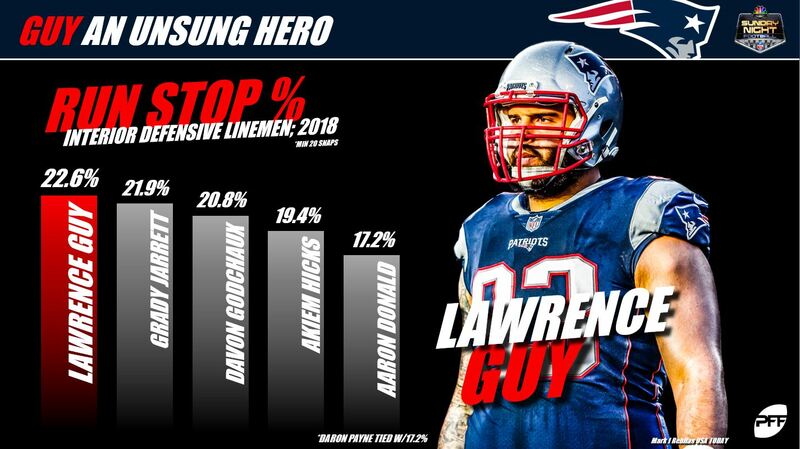 Through two games, interior defensive lineman Lawrence Guy has been an unsung hero on the Patriots defense. Thus far, he’s made seven tackles, all of them being defensive stops, while posting the league’s top run-stop percentage among defensive linemen. 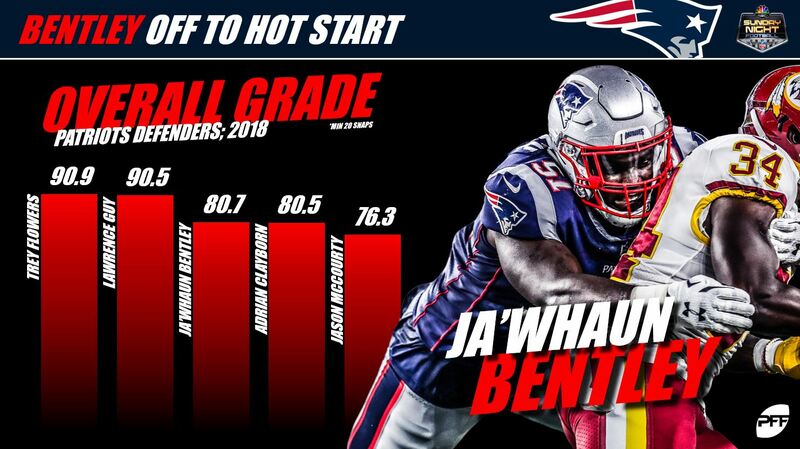 Fifth-round rookie linebacker Ja’Whaun Bentley has far exceeded expectations through Week 2, as he has earned an 80.7 overall grade across 81 defensive snaps. He is currently the third highest-graded defender on the Patriots. Rookie running back Kerryon Johnson and veteran LeGarrette Blount have worked as a tandem out of the Lions’ backfield through two weeks, picking up 13 and 12 carries, respectively. Blount leads the duo in forced missed tackles (three), while Johnson is ahead in yards per carry (4.6). 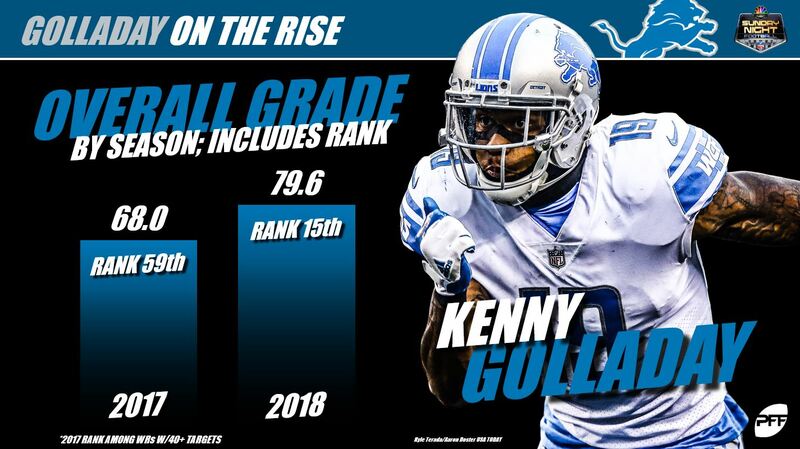 Hauling in 13-of-20 targets for 203 yards and one touchdown, Lions second-year wide receiver Kenny Golladay is off to a blazing start in 2018. He leads all Detroit wide receivers in overall grade at 79.6. 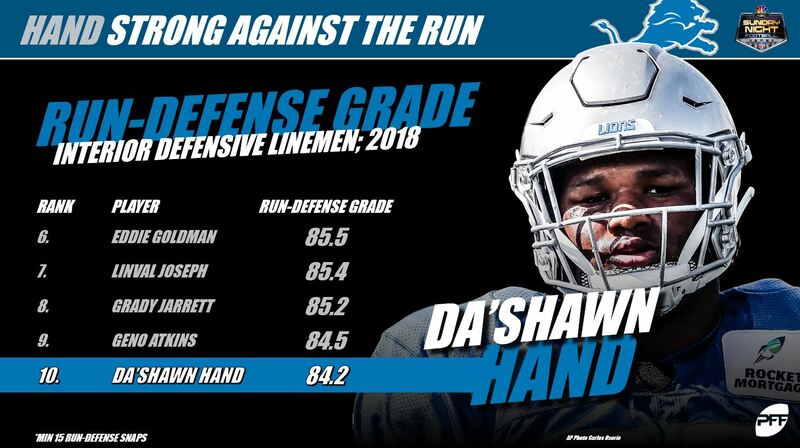 A’Shawn Robinson and Da’Shawn Hand have earned 86.0 and 83.6 overall grades, respectively, through two games. The duo has combined for three pressures and nine defensive stops. Hand has been especially impressive against the run, earning an 84.2 run-defense grade which ranks 10th among interior defensive linemen. Former Florida standout Teez Tabor couldn’t catch a break in the first two games of his sophomore season in the NFL. He’s allowed receptions on all three targets into his coverage for 48 yards and one touchdown.